I couldn't only provide one card for my "embrace" feature this week. It's glitter, once it's out, you just keep on using it. The fun thing about glitter is that are also so many different products that have glitter in them. Besides stand-alone glitter, there are also Stickles or Glittery embossing powders that you can use. Those products are even better suited to the CAS style since they are so quick and easy to apply. 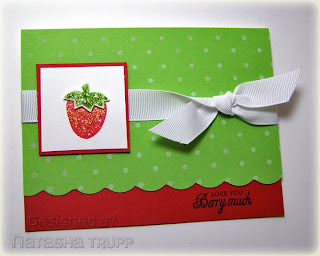 F or this card, I stamped my strawberry (from Stampin' Up's Tart & Tangy) in two steps. Once for the berry itself, and another for the hull. I cut out the hull and popped that over the berry. My glitter product on this card was Stickles. One thing that's kind of important with stickles-it's best to use a waterproof ink. I used craft ink hear, so the Stickles didn't cause any ink running. CAS Points of Interest: A basic layout, with the image on the left, balanced in a triangle with the ribbon knot, and then sentiment(from PaperTrey Ink) below. Scallops jazz up the card a bit. 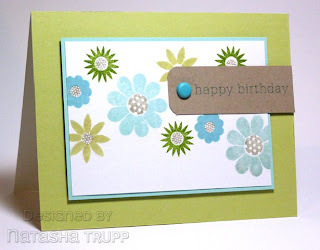 A polka dot background is an asset to any CAS stampers collection, it can really make any background that much better. Plus it's one of the quicker to ink background images available. It's also very forgiving if you don't stamp it straight. I paired a dark jewel toned paper with a metallic paper and ink. This makes a bold impact. All about the proportions again- the card is 4-1/4-inch square, the navy piece is 4-inch square, the silver piece is 2-1/2 inch square. The brads in the corners, they serve no functionality other than making the navy piece not so plain. Pop Dots- I cannot stop using them, the navy layer is raised up. The extra dimension always adds a bit more interest to the card. I saw that a few people have already used the sketch I provided the other day! That's awesome! I also forgot to add in a good keyword for use at SCS, but I saw that you are an intelligent bunch and wisely marked them as FTL1. So that seems like a good format to use for the Fall-to Layout features. For the "Embrace" features, a keyword seems unnecessary, just uploading with the CAS keyword seems sufficient. Sorry folks, this picture had to be temporarily removed. Look for it in the coming months in Card Creations, Quick & Easy. Okay, so here goes for one of my soon to be regular features. This is one of my favorite clean and simple fall-to layouts. It works for virtually any small type image. I've used this layout for Christmas cards, featuring snowflakes where the squares are. I've also done dry embossing in place of the cut out squares, then popped up the smaller image on the raised square. That can make quite an impact! I did the sketch only one way, but of course, it can be used in any of the 4 directions. Another thing, the circle on the sketch represents a knot in your ribbon. That does not have to go on the left side. The key feature here is that the knot off sets the sentiment along the bottom. So whichever side the knot is on, I find that the sentiment should be either central or opposite-sided. Here's one of many cards featuring this layout. Feel free to play along, file the sketch away in your file or book of sketches! This card was inspired by the ribbon I wanted to use. Next up came the selection of kraft cardstock. 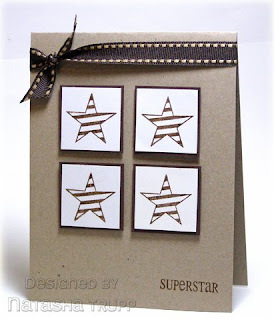 Finally, I bought these stars by Verve Visual recently, and hadn't even used them yet (gasp!). Each square is 1-1/4 of white, with a 1-3/8 chocolate mat. clean lines, punch of colors, minimal embellishments. "white space". . .not every part of the card has to be embellished or stamped on. So I just wanted to share what my goals for this are. I plan to do about 3-4 updates a week. Of those updates, there are a few features I want to do. First off, there will be the general tips and whatnot feature- the exploration of what exactly is it about the CAS that works. This has been a continuing learning process for me. These features will consist of observations and suggestions. Secondly, I thought it'd be nice to do an "Embrace..." type feature. This would be where I would zoom in one a specific type of product and showcase it in the CAS style. Think "Ways to Use It" challenge meets "Keeping it Simple". Thirdly, and the first of these is today's other post, I want to do a "Fall-to Layouts, Colour Scheme, etc." This will be a collection of those layouts and schemes that I have seen or done that I feel really work with the CAS style. Lastly (for now), I would also like to do the occasional CAS artist feature. I am by no means the expert in this area, and it's always awesome to see what others do with the CAS style. I'm sure I'll add in other features, maybe modify some as the blog goes one. And of course, once I have a few other designers on board, there will be even more CAS stampers' creations to see! This is Clean and Simple Stamping. What does this type of stamping consist of? I'm summing it up with these 3 things. This list is not exclusive, but just the items that most come to mind when designing a clean and simple card. #1 Proportions: When making a CAS card that consists of more than 1 layer, keep in mind the importance of proportions. I find it very important to have my image panel centered on my card front. Additionally, that image panel is of a proportional size to the card front itself. So on this card, the card front is 4.25x5.5. 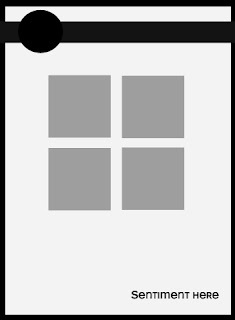 So the image panel is 3x4.25. #2 Solid Images: While definitely not a necessity to the CAS card, solid images can definitely speed up the process. So what does the Clean and Simple style mean to you? I'd love to hear from you!